My posts are always a bit lower this time of year. We had so much snow and cold weather, that it is a real pleasure to get outside and catch up on the yard work. Here are some berry baskets I made a while back with the Berry Basket Die for the Big Shot. 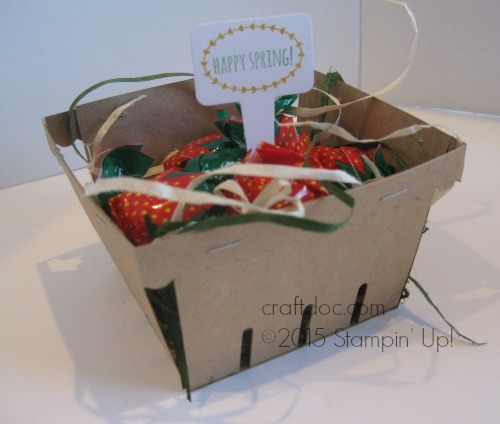 -Use the Kraft paper to make the baskets. It’s a bit sturdier than the Crumb Cake Cardstock. -This basket is sooo easy to put together. 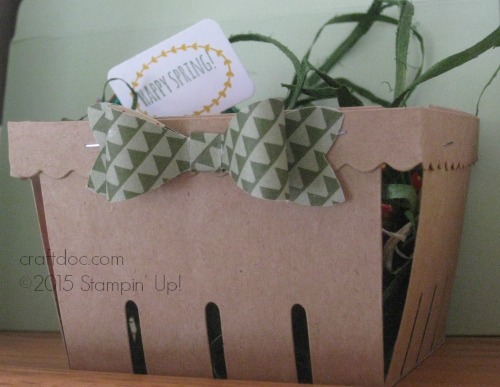 Just add the top strip with the Handheld Stapler by Stampin’ Up! -The Berry Basket die, the bow builder punch and the Handpicked Framelit dies will all be carried over into the new catalog June 2. BUT, the From the Garden stamp set will not. You can purchase all these Stampin’ Up! supplies at my website shop. -Don’t forget that Paper Pumpkin is 50% off for new subscribers. Here’s the promo code SAVE50 and here’s my link. Don’t miss out on the next great kit. Super fun for summer time and traveling.